It all started in the Pentagon in 2012! We met while working together on the Navy Staff a couple of desks apart in a huge cubicle farm. Since we love to talk about our passions and hobbies, it didn’t take long to realize that we were both BBQ aficionados and accomplished pit-masters. And while we came from regions with different BBQ traditions (Memphis area for Billy and North Carolina for Mac), we had similar tastes in BBQ. After sampling each other’s BBQ, we began cooking together and gradually merged our favorite BBQ styles. We drew from Billy’s experiences with Memphis and Texas-style BBQ and Mac’s experiences growing up in a family BBQ business focused on North Carolina style whole hog and chop BBQ. While perfecting our signature BBQ meats, we also developed our delicious side dishes and BBQ sauces. Not surprisingly, our coworkers and friends in the DMV (DC/MD/VA area) were all too happy to be our taste testers along the way. 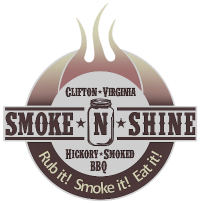 As the word spread about our BBQ and the catering requests intensified, we decided to transition our “hobby” into a legit business, and Smoke-N-Shine was born! Likewise, the demand for our sauces drove the decision to have them professionally bottled so we can share our unique flavors with our fans everywhere. We both still work full time in the Pentagon (for now), but cater multiple events most weekends. When we do get a rare break from cooking and are caught up on our various farm chores and honey-do lists, we like designing and building our own smokers. We also enjoy entering BBQ competitions when we get time, more for the camaraderie and socializing with our fellow pit-masters than anything. We are proud BBQ traditionalists, committed to the art of cooking with offset pits using hardwoods for fuel. While the ever-expanding chain restaurants may be bringing BBQ to more people (especially here in the DMV), we will put our labor-intensive, juicy, hickory and oak infused goodness up against their mass-produced meats any day. Thank you for interest in Smoke-N-Shine and for supporting our passion! Without our friends, fans, and customers, we wouldn’t be able to keep the Smoke rolling and the Shine flowing. Right up there with Baseball, Football and Mom’s Apple Pie, Grilling is an American pastime. There’s nothing quite like the aroma of a steak or burger fired up on the grill, or the luscious and smoky taste of a rack of ribs or brisket that’s been slowly cooked and smoked for 24 hours until it falls off the bone, that tells the neighborhood about your grilling expertise, passion and overall awesomeness. From the very start, the recipe has been straight forward: quality, quantity and service. Over the years, these three founding principles have become our motto.